This is my latest called Sacred Sites. WWW.DAVIDDUNN.COM.AU Don t forget check out my web site. I reckon U should enter the comp. Although the year has just begun, I am already excited about this years National NAIDOC celebrations as we celebrate a remarkable milestone, the 50th anniversary. Year after year, NAIDOC celebrations bring pride and enjoyment to our cities, towns and remote communities. And this year is no different. Our deadly theme for 2007 is 50 years: Looking Forward, Looking Blak. Once again the highlight of the year will be the National NAIDOC Awards and Ball to be held in Darwin on Black Friday, 13 July, a fitting coincidence to celebrate the achievements of Indigenous Australians. Past National NAIDOC winners have included Catherine Freeman, Ernie Dingo, Pat and Mick Dodson, Kyle Vander Kuyp, Anthony Mundine and Deborah Mailman. And of course the hard work of Indigenous people in communities must not be forgotten. Previous Lifetime Achievement Winners Arthur Murray and Elizabeth Morgan Hoffman have focused their lives on fighting for justice and advancing the cause for Indigenous Australians. It is now time to nominate outstanding Aboriginal people and Torres Strait Islanders who have made a significant contribution in their chosen field - whether it is music, arts, culture, education, sport, employment or politics. But don't leave it too late as nominations close for the National NAIDOC Awards on Wednesday 18 April 2007. But before this years NAIDOC winners are announced, we need a poster to celebrate our 50th year. We are calling for Indigenous artists to submit designs for the 2007 Poster Competition. 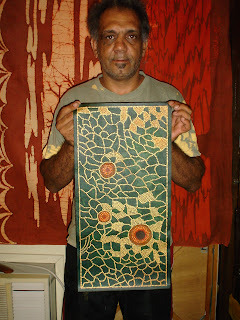 NAIDOC posters throughout the nation but he or she will also receive a $5000 cash prize. Entries for the poster competition close on Friday 30 March 2007. To nominate someone for a NAIDOC award or to enter the Poster Competition visit www.naidoc.org.au and download the relevant forms. Kirky a Koori in Parkes. Oz. Wife, mum, nan, sista, aunt, cuz & friend 2 all.